The maxillary incisor teeth are extracted with the upper universal forceps (no. 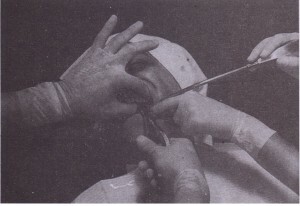 150), although other forceps can be used. The maxillary incisors generally have conic roots, with the lateral ones being slightly longer and more slender. The lateral incisor is more likely also to have a distal curvature on the apical one third of the root, so this must be checked radiographically before the tooth is extracted. The alveolar bone Is thin on the labial side and heavier on the palatal side, which indicates that the major expansion of the alveolar process will be in the buccal direction. The initial .movement is slow, steady, and firm in the labial direction, which expands the crestal buccal bone. A less vigorous palatal force is then used, followed by a slow, firm, rotational force. Rotational movement should be minimized for the lateral incisor, especially if a curvature exists on the tooth. The tooth is delivered in the labialincisal direction with a small amount of tractional force (Fig. 7-60).